One of the best feelings as a marketer is when you spend time crafting the perfect message for your social accounts and then your audience actually engages with that post. Interactions like shares, comments, retweets, and favorites tell you that your messages are resonating with your fans and followers. But how you know when the number of interactions you’re getting is good? And what does “good” mean, anyway? The answer: It’s all relative. A “good” amount for engagement for a marketer in the software industry could be a totally different number than for a marketer in the financial services industry. That’s why we put together the 2015 Social Media Benchmarks Report -- it's 49 pages of of social media data and analysis from over 7,000 business in nine industries. In this post, I’ll analyze our findings on audience participation on social media for each of the industries represented. Find your industry below (or use our jump-to links to head directly to your industry) to see how much interaction is happening relative to how much a company posts a week on social media, and also get some key takeaways for how to apply this to your own social strategy. 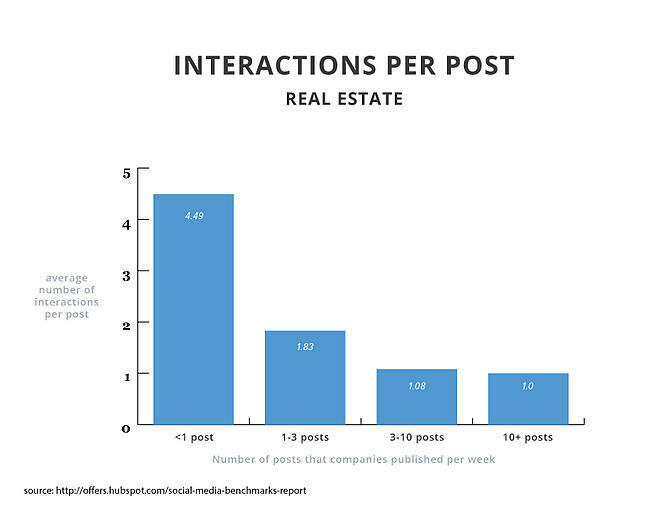 What’s actually happening in the real estate industry is that as post frequency increases, the average number of interactions per post decreases. Companies that are posting about one post per week are getting the best ROI compared to companies that post more than once. If you’re in the real estate industry, consider trying to “feature” one piece of inventory per week on your best-performing channel. Now that you know one post per week gets the highest amount of interactions, you can use that to your advantage. 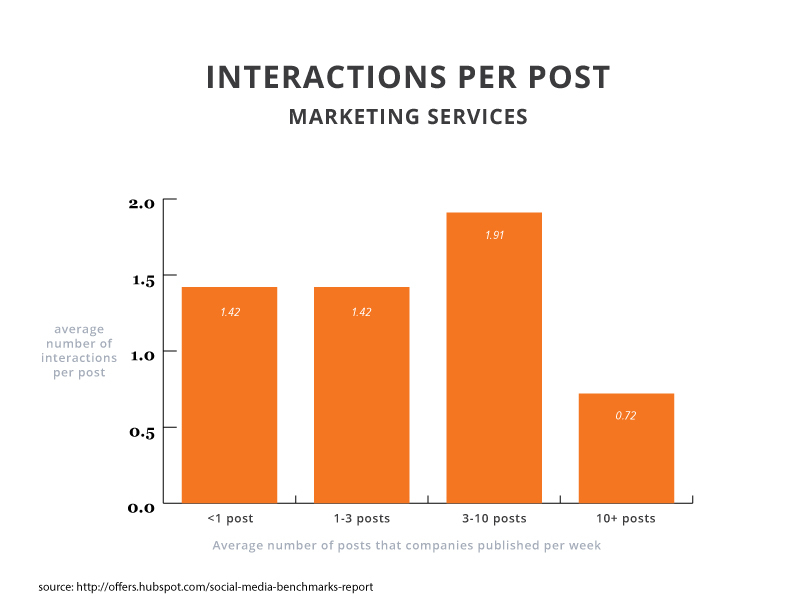 This industry’s sweet spot lies with companies that are posting 3-10 posts per week on social media. This is likely because that number of social posts -- assuming the content is up to par -- makes these folks look like thought leaders in their industry, and probably have some loyal fans and followers that want to gobble up their content as soon as it’s posted. If you don’t find your own analytics aligning with our findings, consider not only how much you’re posting per week, but also the quality of your content. You don’t need to have 10 separate pieces of great content to get this level of engagement. You do, however, need to have some pieces of great content with the knowledge of how to reposition them for different social networks. 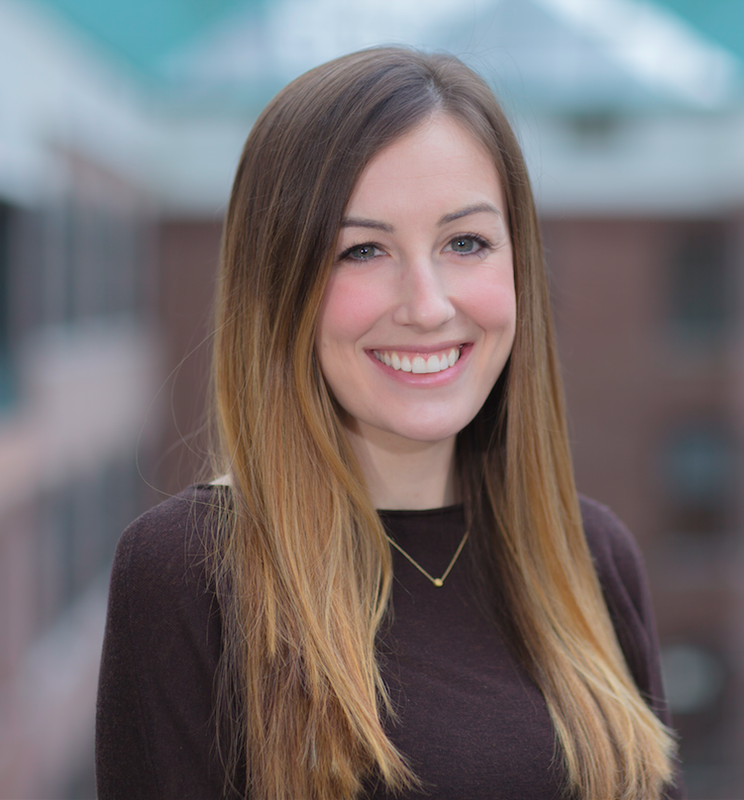 Learning how to recycle and reuse content can lead to great return, like this company that gained 400+ leads and 6 deals from recycling content. Like the real estate industry, companies that post 1 post per week on social media see the best ROI for their time spent creating content for that marketing channel. However, while we see a dip in interactions for companies that are posting 1-3 times a week, we see an increase in engagement when companies post 3-10 times per week. If you’re in the software / tech industry, consider posting once a week or making sure you’re getting a good 5 or 6 posts in per week. Our findings tell us that you’ll need to pick only one of these paths to get the most possible interactions per week. If you’re a newer company just ramping up your content strategy, try featuring one piece of content per week for your audience. If you’ve got a lot of content at your disposal to share, try hitting that 5-times-a-week mark. And like the marketing services industry, don’t forget that you can reposition one piece of content to your social networks to get the most out of the content you’re creating. 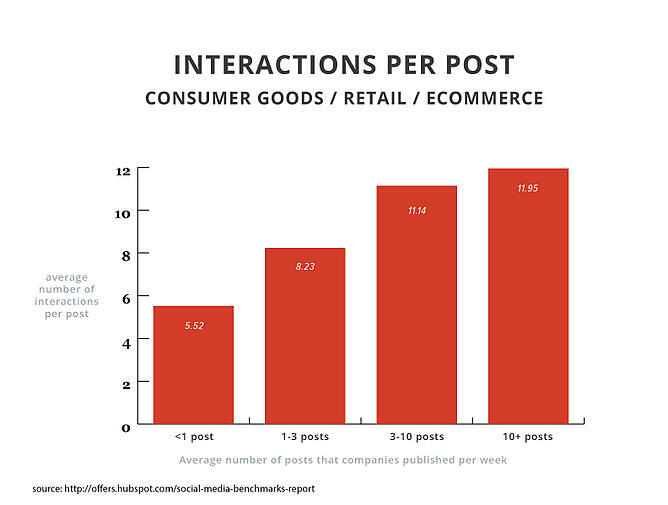 While companies that are posting once a week are getting the most bang for their buck, companies that post 1-3 times per week and 3-10 times per week aren’t far behind. 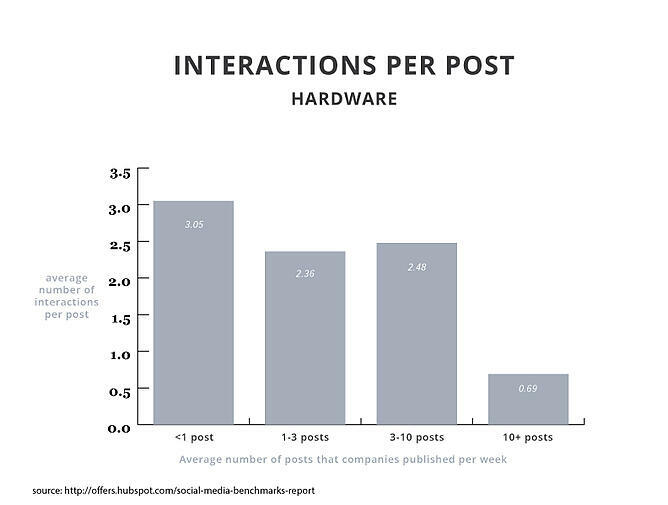 However, check out the dip in interactions per post when companies post more than 10 times per week. Of all the industries we’ve mentioned so far, this is the lowest we’ve seen. If you’re in the hardware industry, here’s a good rule of thumb when considering how much to post on social media: If you’ve got more than 10 posts planned per week, reconsider how you're devoting your time. Instead of pumping out a ton of posts on all social networks, prioritize your posts by the network where you typically see the most engagement, and then by topics after that. If you still have more than 10 posts, try moving those to the next week or for a few weeks out to see if your engagement per post goes up. You never know until you try. This is one of the more interesting graphs we’ve seen thus far in our report. 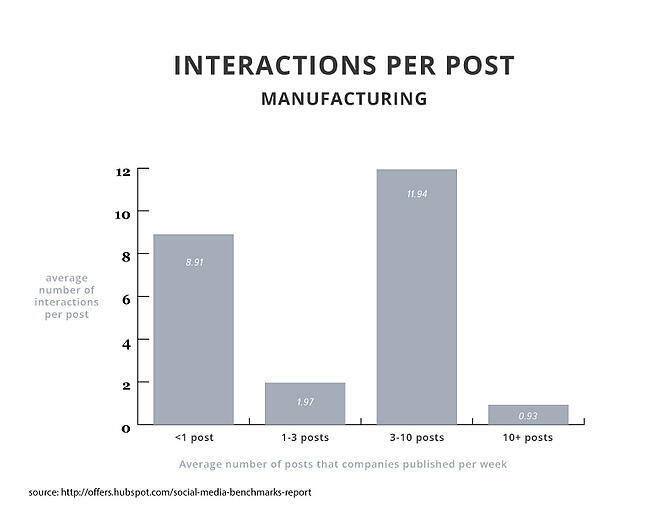 There are two sweet spots for this industry when it comes to getting the most interactions per week: companies that post 1-3 times a week, and those that post 10+ times a week. The moral of the story here? Posting as much as you can is worth it, but is not, 2-3 times a week is good. If you’re in the nonprofit / education industry and only posting once a week, try ramping it up to two or three times -- it looks like you’ll be happy with the results. If you want to aim for the 10+ times a week, really take the time to flesh out your social media editorial calendar. Can you make Mondays all posts about X? Could you scatter a tips and tricks series throughout every day of the week? Thinking about ways to regulate and repeat some of your content might help you a lot. 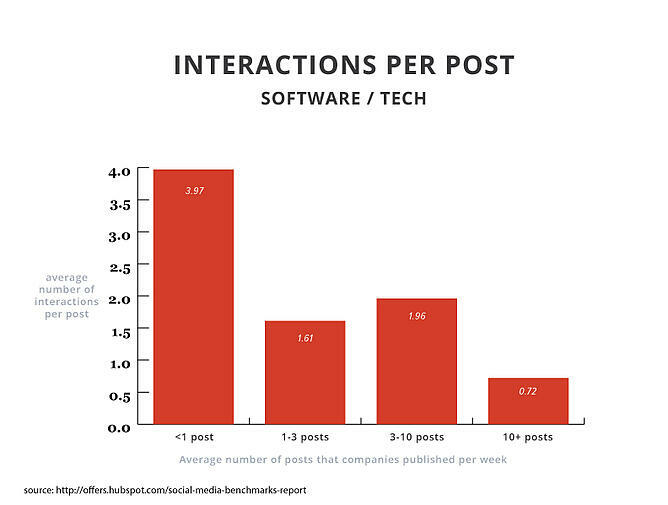 It’s easy to see from the graph above that companies in this industry get the best results when posting once a week. Any more than that, they’re looking at a steady -- but not extremely drastic -- decline. Even when posting once a week, though, the average number of interactions per post is the lowest of any industry in our report. 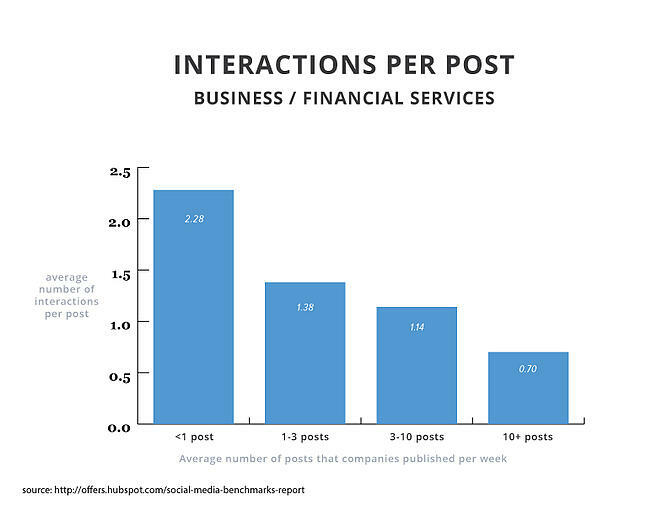 If you’re in the business / financial services industry, your posts may not be getting much action when it comes to engagement on your content (but you can be rest-assured you’re not alone). If you want to try some new tactics to spruce up your social media marketing, check out this free guuide to writing effective titles and headlines. 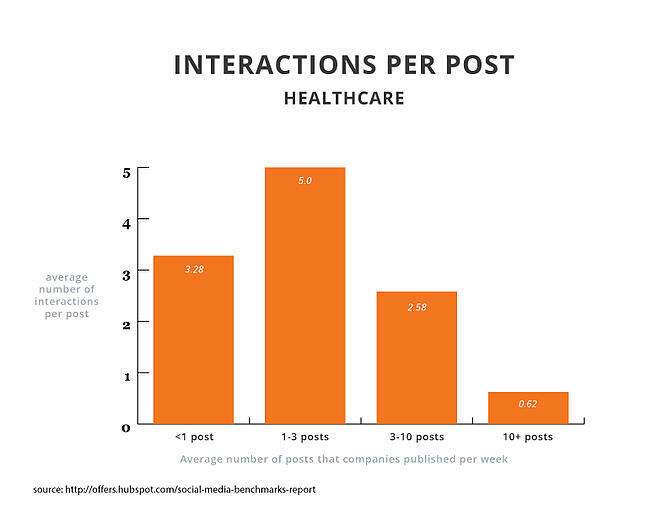 It seems like the healthcare companies that are getting the most interactions per posts are the ones that post several times a week -- not more, not less. You can see that the ROI is lower even in the 3-10 range, and is drastically lower in the 10+ posts a week range. If you’re in the healthcare industry, try posting once a week in these three categories: your company, the industry, and popular relevant content that's being shared with your target audience (that's also relevant to your company, of course). To help you do just that, we suggest heading over to your audience's favorite social networks and searching around with relevant keywords. Not only will this help you find content to share immediately, but it could also help with content ideas for the future. Not too far in the future, though -- you want to make sure the topic is relevant and fresh when you share it. If it's not, you won't get the engagement you're looking for. I think one line here sums it up: The more posts, the merrier. Companies in this industry are apt to get more and more interactions on what they post the more they post. This is important because this industry is one where brand loyalty is everything. Buyers today are much more educated about your company before they buy anything from you, and they have a lot of choices. Getting folks to choose you is a big deal -- and social media can help with that. If you’re in the consumer goods / retail / ecommerce industry, it might be easy to say, “We don’t really have anything new to post about.” Not true! If you’re trying to cultivate loyal customers, reach out to existing customers and figure out what they like about your company. Then, use that information to inform your social strategy. Maybe folks like you because you have the fastest X out there, or the most comfortable Y. Lean in to what makes you special and use those topics on social media to create more loyal customers for your business. 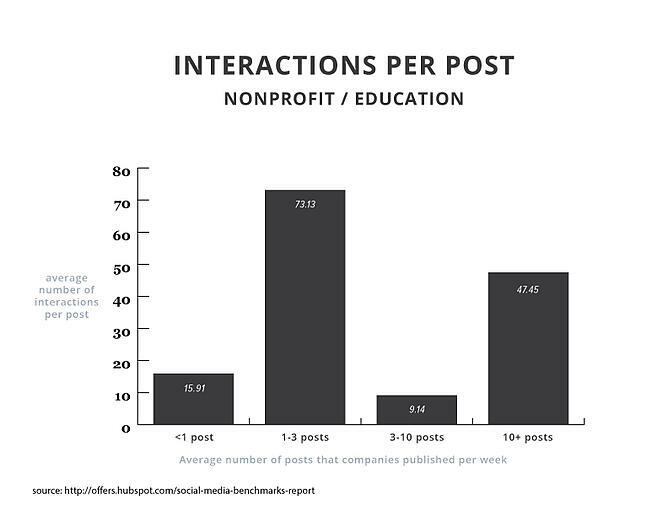 You can really see by the graph above where the sweet spot is for getting the most interactions per post. Similar to the software / tech industry, manufacturing companies do best with either one post a week, or at least a handful -- but definitely not more than 10. The drop-off from the average number of interactions in the 3-10 category to the 10+ category is downright scary. If you’re in the manufacturing industry, first focus on getting one relevant post out per week. If you're seeing good engagement with that, think about how you could repurpose content you already have to stretch that one post to a week to, say, four. It's most important that you've got a solid hold on where that one post a week should go -- Twitter, Facebook, LinkedIn? Once you've found your place, you can use that platform to experiment with more posts. Want more data on social media benchmarks by company size, or more social data on your industry? Download our free social benchmarks report.